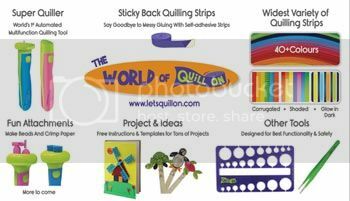 Four years ago I started my Etsy shop. As I was designing my earrings I came up with a couple designs for Halloween. You can see them, along with some of my other earlier designs (some of which I have retired, others which I have altered, and some which I still make the same!) in this post. 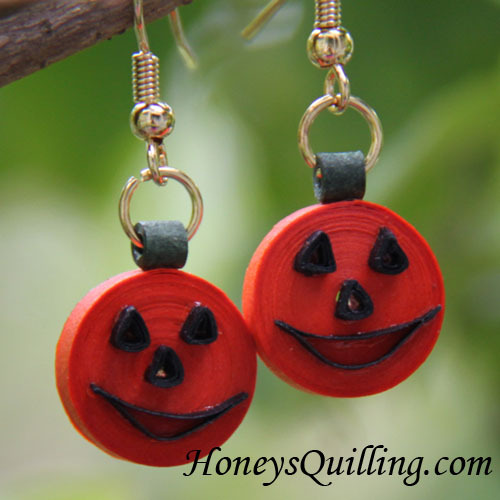 The Halloween earring that I designed was a simple Jack O’ Lantern, with a solid base. 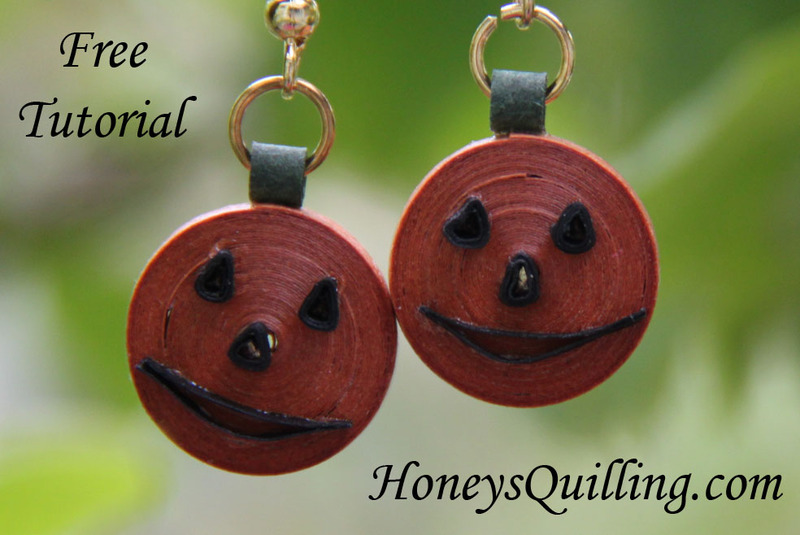 It is now more than four years later and I am excited to share that pattern so that more people can make these simple yet cute earrings for themselves! *If you haven’t checked out the witch hat earrings tutorial yet, click here to see it! 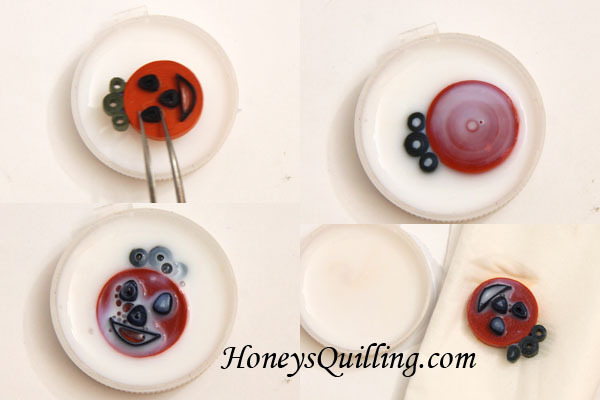 *note* If you need beginner quilling instructions, check out this post before continuing. I used 1/8″ width for the base and top of the earrings, and narrow for the face pieces. You can also use 1/8″ for the face pieces if you’d prefer. First you will need to prepare your strips. Roll the 72″ strip into a tight roll as shown here and glue the end tight. Notice that the end of the roll is ripped, as it glues down more smoothly that way. 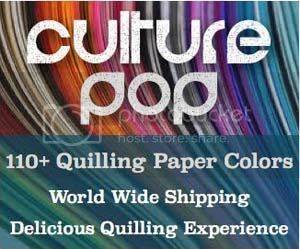 Take the 24″ strip of black narrow paper and rip it into six 3″ strips (there should be one 6″ strip left). Roll each 3″ strip into a tiny tight roll. Pinch it into a teardrop, then press the bottom of the teardrop flat to make a triangle. You will have to use your fingernails to pinch all three corners tightly to shape it correctly. Time to assemble your Jack O’ Lanterns! Squeeze a bit of glue onto a surface (I like using a plastic surface), pick up each piece with the tweezers, dip into the glue, and place onto the orange base. 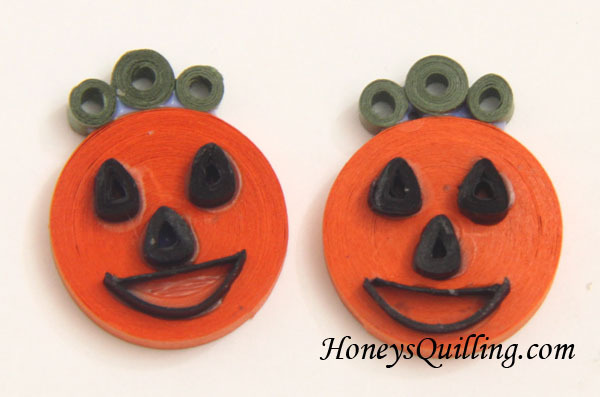 Now you need to add a top to your Jack O’ Lantern to make it into earrings (or you can just add a magnet to your Jack O’ Lantern or glue it onto a post for post earrings as well). There are several ways to add a top to dangle earrings. Click here to read a post showing several ways to do this. For this pair I decided to do the three circles on top, as the wrap around method wouldn’t look as good on a Jack O’ Lantern. You will need to add sealant to make sure your earrings are sturdy and water resistant. There are many sealants that you can use! Check these posts for some tips on sealants. Some sealants will be liquid (such as Ceramcoat Sealer, click here to read my review and tips about it) while others will be more thick. Some thicker ones you can mix with water to make them thinner (like Diamond Glaze – click here to read my review and tips about it), while for some that doesn’t lead to a good finish. I am experimenting to see which ones work with this method. If you use a liquidy sealant you can dip the earrings in as shown here. 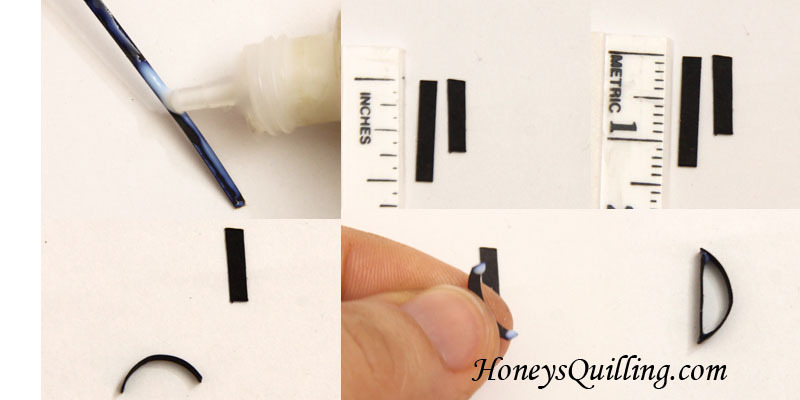 Use tweezers, flip the piece over a couple times (make sure it is fully dry before you put on the sealant!) , set on a tissue for about 10 seconds and then place on a plastic surface to dry (move it around on the plastic surface a couple times in the first 10 minutes or so so that no sealant pools underneath. If you are using a thicker sealant you’ll need to do one side at a time and use a paintbrush to apply it or squeeze it carefully. NextSealant Experiments and Mistakes – Don’t Mix PPA Matte with Water! You are rockin’ these earrings! Super cute~I think they are so cute and thanks for sharing and playing again in the PDE Linky Party challenge!